This is cool--we're watching DH today, and my son noticed when the trio arrive at Yaxley's floor, you can hear the rain from his office. It's really faint and I had to go back twice to hear it. Nice touch! I'm watching DH1 tomorrow on my friend's Blu-Ray in Maximum Movie Mode so of course I'm chilling out tonight and rewatching HBP. I noticed Nigel cheering in the background at the Gryffindor celebration for the first time and picked up on Ginny's reaction to Ron and Lavender. She watches it all happen and looks at Hermione as she leaves the room with a very sad/flat expression, almost hinting at what has long been surmised about by the fandom, that Ginny is very much aware of Hermione's feelings for Ron. I also noticed Pigwidgeon and Crookshanks in the background in the scene of the trio up in Ron's room at the beginning. "We spent time here, we made friends here. That’s a part of us. Because Hogwarts is bigger than any of us, it’s bigger than any of its Founders. And it's gonna be around here long after we’re gone. Maybe we’ll see our kids go here. 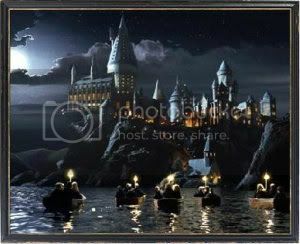 That’s the thing about Hogwarts: no matter how long you’re away from it, there’s always a way back." I didn't really notice the hair when I saw it in the theater. I guess I just was really focused on Hermione herself at that point. I'd reread the book fairly recently before seeing the movie, though, so I picked up on the jeans line right away and thought it was great they had it in there. Last edited by Dead Star; May 6th, 2011 at 6:01 am. You are right. I didn't notice that! I am watching all the films again....getting ready for the last one. And I am very surprised on stuff that I have missed that you guys all spotted. Severus Snape: I want your word! Albus Dumbledore: My word? My word, Severus, that I will never reveal the best of you? Very well. Albus Severus, you were named for two headmasters of Hogwarts. One of them was a Slytherin and he was probably the bravest man I ever knew. I would love a close up screen shot of those files so I could read them. Yes that would be good, they did something like that in a episode of Doctor who I sat there for hours reading the news paper in the episode. But yes since I discovered who they were on, I wanted to read them to see what they say. Something I noticed the last time I watch HBP, is that when the DE kidnap Ollivander from his shop, they also take a bunch of wands in boxes too. Pretty smart thinking, considering how many people we know end up losing their wands later on. Ha, I noticed that tonight too! I wonder if that was coincidental or done on purpose? I guess this would qualify more as a mistake, but I'll post it here anyway, since I didn't notice it the first time. After the wedding, when the trio Disapparates, etc, none of them say Voldemort's name, which is how I thought the trackers were able to find them! Hermione Granger: If Voldemort's really taken over the Ministry, none of the old places are safe. Yes, you & Ajna are correct! Also right after Xenophilus says it at the Lovegoods. When Voldemort speaks to Pius Thickness after Snape arrives, I've only just noticed Nagini moving round the floor near his feet (Pius), no wonder he looked nervous and twitchy. I hadn't noticed any of the things in the first few posts on this page... I'm definitely going to have to watch the films again! I always wonder though, if to a non reader, movie only viewer, if they make the actual connection. Does a non book reader know that that is Moody's eye? Or do they just think it's another odd magicality of the Wizarding universe. There's nothing to indicate it belongs to Moody, or the cruel implications that it carried in the books. I think it goes along the same lines as the debate about the final duel with Harry and Voldemort....can you make it have the same impact for the non reader? That seems to be a common thread. What does it mean for someone who's never seen or read it before? And in OOTP, right before Dumbledore and Voldemort duel, Tom bows to Album. It happens in the line, "By which time I shall be gone (BOW), and you shall be dead." I only noticed this week when watching OotP for the umpteenth time that in the DA lessons Harry is teaching them Levicorpus. Neat, since he doesn't learn it until HBP! Country music star Julianne Hough has a cameo in SS/PS! !